Oases is for individuals or companies offering tutoring, training, after school care, sports, ed therapy & test prep. Pricing based on Active Students by Tiers. Starting Tier is $99.00 p/m. Oases Online manages all data for a tutoring or instructional business. Schedule, invoice, take payments including credit cards. Link available sessions to your website for sale and processing. Load test data and create learning and goal plans and report on progress against your goals. Find the right tutor for a student with intelligent matching. Oases calculates gross payroll for your employees. Invoice individuals or create invoices based on a contract or federal grant. Oases Online Reviews Recently Reviewed! Indispensable Tutoring Management Software | Highly Recommend! 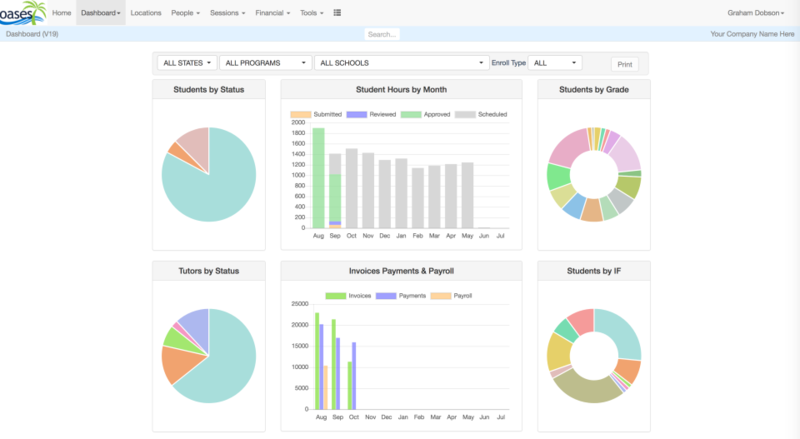 Pros: I like that the software is easy to use abs that it covers everything from testing students, creating learning plans, scheduling students, scheduling tutors, billing clients, automated emails, paying tutors, and everything in between. This software does everything and more! It helps me organize my data so that I can focus on providing the best tutoring experience than my competitors. They have an app! Overall: I came across Oases a few years ago as I was looking for ways to grow my business. I learned a lot from reading their 'tutor report' blog. I finally decided to subscribe to their service a year ago and I am so happy I did. Here is a breakdown of why I love Oases. 1) Stella Customer Service: I was highly impressed that Oases took the time to train me on their software. They scheduled one on one training sessions and worked with me to set up my program! 2) Intuitive Software: Oases is the iPhone of management software. 3) Personable Staff: Oases has a very responsive staff. They are always willing to walk you through any questions you may have. They are very responsive to customer request tickets. They are easy to talk to and very efficient and effective! 4) Value: Oases is priced well and worth every penny! 5) They have an app! My tutors can sign in with the app to checkin about their session, they can also access student information and contacts through the app. I can also approve tutoring sessions, look up tutoring contacts on the app making this a good 'on the go' tool. I have not even scratched the surface of all I can do with Oases. They have taught of everything! They continue to add more beneficial features that are always on point. I will highly recommend Oases. Tutoring is a very saturated market with big players! Oases help me remain competitive in this market! Recommendations to other buyers: I will recommend you schedule your training session right away! It is a one on one training session and they are very good at helping you get started! Oases does a lot of things and it is very beneficial to learn to utilize its features. Pros: All aspects of the product. Cons: No improvements that we could identify. Overall: We have worked with OASES for the past 8 years and used the software for that time. After using excel spreadsheets and Cayen, it was a relief to finally see a demo on this product. We always used all functionality except the payroll module, therefore, we cannot comment on it. The operational aspects of OASES software are outstanding and very flexible, no matter how your operation runs. Once we started using this system, we had an all inclusive system, which could management the tutoring schedule and our staff. Flags can be set to remind all shareholders of upcoming deadlines and activities, which are overdue. For people who want to doing testing online, this module is very effective and again keeps all the information in one spot for a student. The customer service department is wonderful and demonstrate their interest in all clients, regardless of size. If you are in the tutoring business or after-school academic activities, you cannot go wrong getting a demo from OASES. Should you want to talk to a user, we would be pleased to talk to you about the product. Just ask your contact at OASES for the contact information. Recommendations to other buyers: This is the best software for a tutoring business in the industry. It was developed for our business and not adapted from another industry. 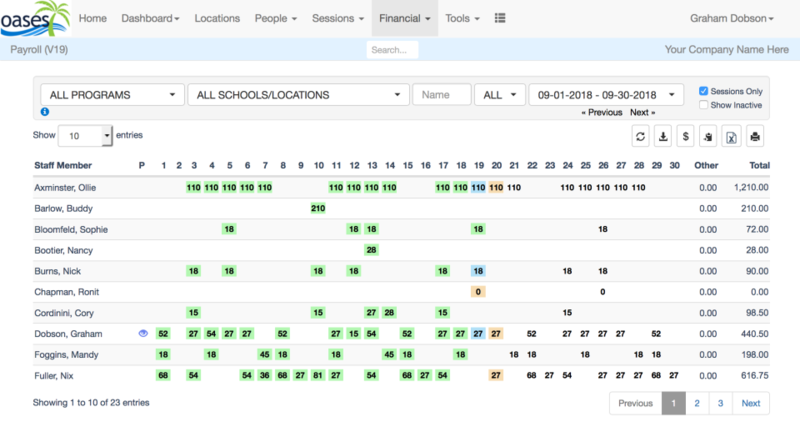 Perfect solution for managing tutors, students, school districts, and staff. Pros: It's easy to set-up accounts, manage day-to-day, and tutors learn it fairly quickly. Cons: The software is set-up for the most part with group sessions in mind. This isn't a problem per-se, but it takes a little bit of training to make sure tutors understand how to log "one-on-one" training sessions. 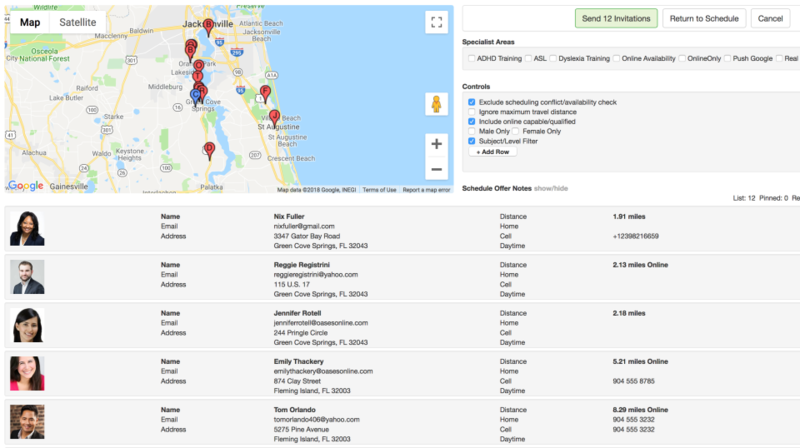 Overall: We have been in the tutoring business for over 10 years, and have worked with various systems such as EZSES, Cayen, etc, and Oases is bar none the most comprehensive and easiest to use solution for managing a tutoring business. The staff at Oases was extremely responsive in helping us set-up Oases to our specifications (including bonuses, various pay grades, dozens of different school districts, schedule restrictions, etc). They remained very responsive to any issues or questions that arose throughout utilization of Oases. Recommendations to other buyers: If you're not yet using it, you should highly consider it. After years of trying to manage our business with excel spreadsheets, and a few other platforms, we were thrilled to have moved to Oases. We have been using it successfully for over 3 years, and are still loving it enough to write this unsolicited review. This is my second go around with Oases and I came back because the software has been effective in helping my company manage our tutor and the entire tutoring process. They have many features that I have not used and I'm sure if I did it would be even more effective. Oases also does an excellent job with customer support. They trained me well and they are available to help my company navigate our unique needs. They are super responsive which is of utmost importance to me as I have clients who typically must have answers sooner than later. We have had a great experience with Oases. It helps immensely with simplifying our record-keeping. Pros: The software is easy to use with minimal training. 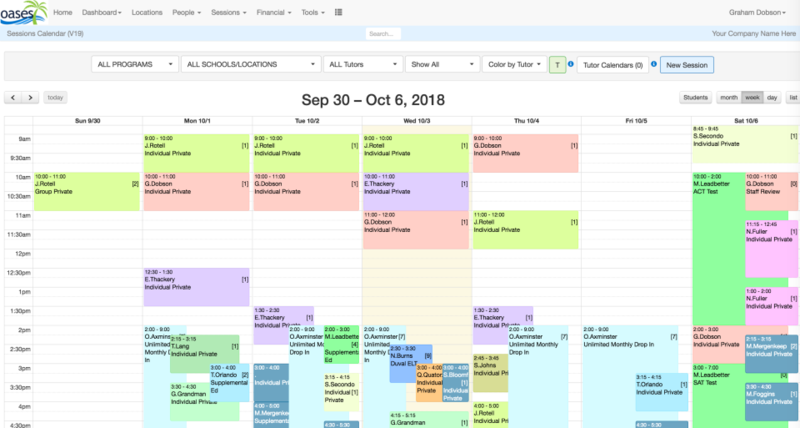 You can do everything in one place from testing students, creating learning plans, assigning tutors, billing clients, automated emails, tutoring hours, and so much more. We are able to stay organized and on top of all aspects of our tutoring company. Cons: The only issue we have ever had is with the tutors entering data on the app on their cell phones. It is not as straightforward as the webpage. As long as the tutors enter data on the webpage, all is good. Pros: It is not user friendly our tutors get frustrated easily. Cons: You as the consumer are charged by student. You have to deactivate all student not actively tutoring in order to access them if needed you have to reactivate them and be charged. Overall: Its pretty poor I am not impressed with it at all. I would not recommend them you can only get support via email and they charge you for training. Pros: Easy to track student hours progress. Cons: The system does not allow users to create customized reports. Recommendations to other buyers: No, great software. 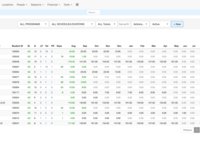 Custom Reports available to Admin and Coordinator level users. The best data management software out there. Unbeatable customer service!!! This system was very thorough and detailed about maintaining information. Pros: This system was very thorough and detailed about maintaining information. It made managing the calendar and the renewals easier. Cons: It was very difficult to learn. We spent a lot of time playing around with the system to try to figure out how it works. Thank you for your review of Oases. In the 2 years since you started using the system we have added many features to make learning our comprehensive, enterprise system more intuitive for new users. 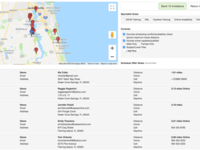 Oases is the most flexible tutoring management system allowing many methods of scheduling, invoicing and tracking to accommodate most business models, with that does come the decision of which one to use and regret that you found this time consuming. We would be happy to show you the improved system at any time and welcome you back as a customer. Again, thank you for your review. 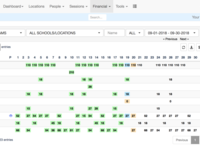 OASES Online Scheduling system is amazing! Comments: As a small business owner, I ofttimes found myself losing valuable time each and every day attempting to manage the scheduling and invoicing aspects of my business. In short, I was being held hostage to an unproductive and outdated paper system that resulted in numerous lost hours of productivity. 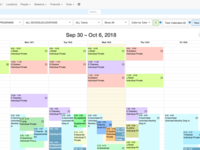 And then one day I happened across the Oases Online scheduling system and my life as a small business owner was forever changed for the better. 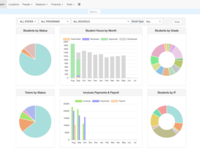 This system streamlined my invoicing and scheduling operations and consisted of the added bonus of offering relevant common core testing for my students and the ability to communicate student progress with my parents as well. It should also be noted that the IT team and customer service department for Oases provides small business owners with cutting edge up to date technology enhancements not usually affordable for small business owners. They are quick and responsive to all issues and have the added capability to meet your the individual needs of your specific business. I love the Oases scheduling. They have allowed me to spend more time working "on" my business instead of wasting time on unproductive tasks "in" my business. Pros: System is incredible powerful, very beneficial to our business. Cons: At times it can seam too powerful and confusing. Once you get used to it, it is amazing. Oases has been great for my business! Cons: I have not been able to master how to smoothly conduct recording hours, invoicing and billing for all of my clients with multiple children that we service. Overall: This software is what I needed to help me expand my tutoring company. I wanted a software that would make streamlining all of my business processes easy and I have found it! Although I still have not scratched the surface of all of Oases's functionality, I am eager to continue to delve in and learn how to fully use this software to support my business. In addition, customer service has been excellent! They have always come to my rescue when I needed their support. Cons: Pricing for text messaging integration. High level expertise is needed for in-depth use of all functionalities. So, it is to be factored into where high employee turnover is an issue. Overall: I am happy with its functionalities, and pricing could be competitive. Overall: As a provider of corporate training programs, we struggled with providers that catered only to tutoring. Oases is a fantastic service, made even better by a team of responsive programmers and client support that have helped us make the program work perfectly for us. OASES is a great program and is very comprehensive. Pros: It provides the functions we need to effectively run our educational business. OASES has many features so I am sure it is a great tool for tutoring companies that are both large and small. Customer support is amazing, helpful, and extremely responsive. That alone makes it worth using. Cons: My only complaint is that the interface is not so easy for our tutors. There are have quite a few (especially some of our middle-aged folks) tutors who have struggled learning it. So extra training is necessary for these folks. Comments: I haven't yet used all the different segments of the oases software. There is much more that I can do with the software to enhance my business and I intend to do that. So far my experience has been good. The software helps me to be more efficient. I can provide information quicker and easier to clients. It helps me to keep proper record and makes reconciliation more manageable and less time-consuming. I am still learning the product. There is much more to explore. Comments: oaSES online is a great tool to manage your business, keep track of hours for students enrolled and for use to keep track of available resources. I started using oaSES in 2010 and have continued using it for the business ever since. The management has been more than accommodating in down months to accommodate our needs and preserve our information. 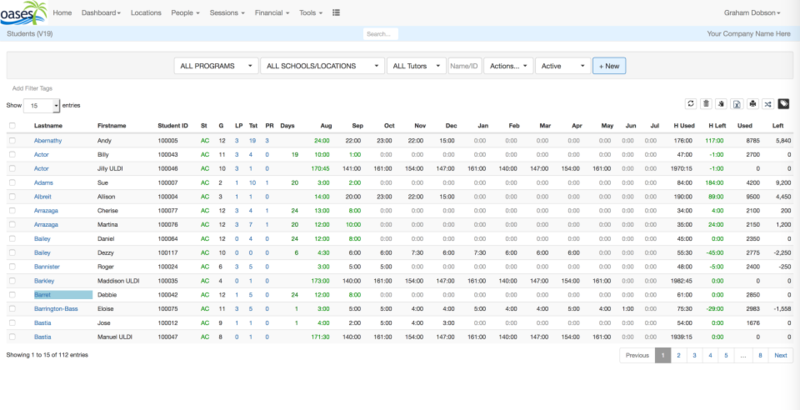 Comments: Oases is a great tutor scheduling and management software program. It has transformed our operations and has allowed our company to grow. With Oases our company is able to keep and maintain accurate records on our tutors and students at all times. Oases is a very user friendly program and their staff is always available to answer any questions. Comments: We used a couple other managements systems before Oases and couldn't be happier to find these guys. This is a thorough system with many powerful capabilities which has made our operations a lot more efficient. We're also extremely happy with the customer service. Highly recommended. Easy functionality and even more amazing support! Comments: This software has changed my business around. Whats more impressive is their amazing staff that works with you hand in hand to integrate everything in your business. Do not know what I would do without them! Comments: The OaSES platform is an extremely robust platform for after school tutoring organizations and different types of tutoring companies. The support team are responsible, professional and extremely knowledgeable.